This property is directly associated with the period of reconstruction and commercial redevelopment (1889-1902) that took place during the decade after the 1889 fire, which destroyed 64 blocks of commercial and waterfront industrial buildings. While the reconstructed commercial district remained fixed within five blocks of Yesler Way and First Avenue, substantial commercial construction began to gravitate further north along First and Second Avenues and toward the well-established residential district that survived the fire. By 1900, more than 29 street railway or cable car lines were in operation, many constructed by private entrepreneurs to promote suburban residential real estate holdings. The expeditious development of suburban residential neighborhoods after the turn of the century occurred in tandem with the rapid northern expansion of the commercial district and the gradual absorption of the old residential area by commercial real estate development. None of the older residential properties and very few intact commercial properties dating from this era remain within the downtown commercial core. Buildings specifically designed to be devoted to specialty retail or department store use typically included lower floor level commercial display spaces and upper floor level loft, sales and/or storage areas. This building type did not require as much natural light and ventilation as neighboring business blocks and hotels; thus, lot coverage and building mass could be maximized. Specialty retail and department stores typically required more elaborate interior finishes and fittings, as well as more elaborate exterior construction with large display windows in order to exhibit merchandise and often included canopies or awnings providing pedestrian protection. This two-story building is actually composed of three separate but unified structures constructed between 1898 and 1914. The southern three bays appear to date from c.1898, the northernmost bay from 1914 and the bay between them from c.1900. All three of the components were built for Amos Brown or the Estate of Amos Brown, and it was historically known as the Brown Building. The original 1898 portion of the Brown Building appears to be the oldest extant commercial building remaining in the commercial core. Amos Brown (1833-1899) was raised in New Hampshire where he began to work at the age of ten in lumber mills that were owned by his father on the Merrimac River. In 1858 he was drawn to the Pacific Northwest by gold discoveries in British Columbia; however, he instead settled in Port Gamble where he worked in the lumber milling and the logging business until 1865. During this period he ran logging camps and purchased interests in logging teams that were then contracted with various mill companies. In 1861, he visited Seattle although he had already purchased local real estate - extending from Spring Street and Second Avenue to waterfront - in 1859. He gradually proceeded to obtain other downtown land parcels that became prime commercial real estate by the end of the century, including the SE corner of Second and Cherry (site of Alaska Building) valuable tide lands and timber lands throughout Puget Sound. In 1863, along with two M.M. Maddocks and John Condon he invested in construction of Occidental Hotel, Seattle’s earliest premier, tourist-oriented hotel. After marrying in 1867, his family home was constructed at First Avenue (Front Street) and Spring Street. He is known for having had close relationships with native Duwamish people, especially Princess Angeline, Chief Seattle’s daughter. He built a cottage for her and Mrs. Brown and his children cared for her at the time of her death. Upon Amos Brown’s death in April 1899, he left a significant estate to his wife and children. His son Alson Lennon Brown (1868-1942), an attorney, became the president of Amos Brown Estate, Inc., the entity created to develop and mange his real estate and other holdings. The original 1898 portion of the Brown Building appears to have been constructed prior to Amos Brown’s death on land that was part of his original real estate investment. By 1903, major commercial buildings had been constructed on Brown’s property along Second Avenue between Spring and Seneca Streets, including the Lumber Exchange Building (1902, destroyed) and the Cyrus Walker Building (1903, destroyed). Interestingly, both of these buildings had close associations with the lumber industry and Port Gamble, as Cyrus Walker was an official with the Puget Mill Company. The Brown Building was a much more modest scale than these commercial buildings and other nearby retail buildings, indicative of its earlier construction date. By c.1900, the Stone, Fisher & Lane Store was located in the Brown Building and the initial addition appears to have been under construction. The building facades included prominent name plates at the parapet and “Dry Goods, Carpets, Millinery” signs above the storefronts. Stone, Fisher & Lane started in 1891 in a small store building in Tacoma. By 1896, they had opened a branch store in Everett and by 1900 they were operating this store in Seattle. In 1903, the chain expanded to Olympia and by 1905 they had established a store in Bellingham, the largest department store outside of Seattle. They also operated a wholesale warehouse in Tacoma. In late 1905 two large, five-story department store buildings were under construction for the Stone, Fisher & Lane Department Store chain, one in downtown Tacoma and the Stone, Fisher, Lane Department Store (Galland Building, 1906) located at the north end of this block. Their Seattle store building was initially leased from Caroline Kline Galland and subsequently from her estate. It is not known for what purposes the Brown Building was used after the department store moved to the new building in 1906. In 1914, the third component was constructed for the Amos Brown Estate by S. G. Combs and built to match the earlier portions of the building. In 1921, the Brown Building was purchased Moses Prager the proprietor of Prager’s Clothing, which was a long-time retail shop at the corner location. 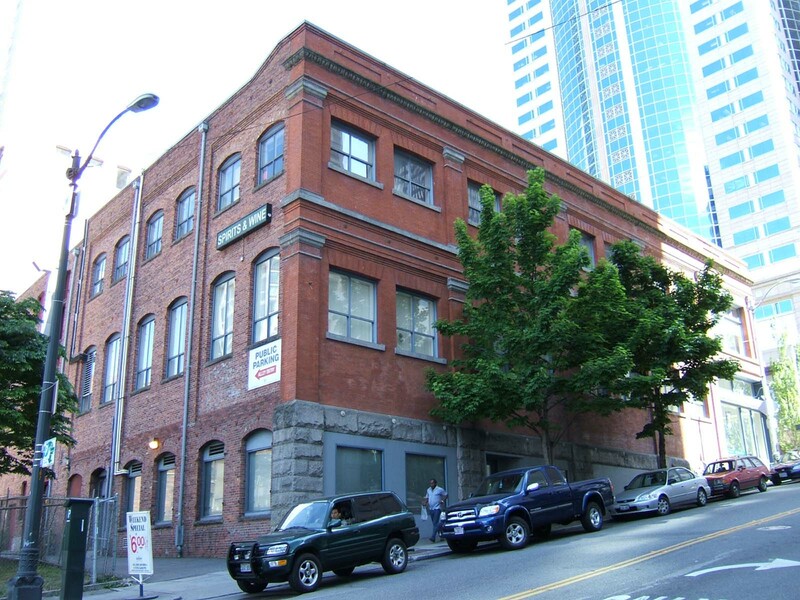 By 1937, the Seattle Trunk Factory was located on the upper floors, Geo. Carrol’s Trunks & Luggage Store was in the central c.1900 bay and pet store was located in the northern 1914 bay. The property appears to have remained in Prager’s ownership until 1961 when it was purchased Samis Land Company. In 1985, the building was leased from Sam Israel (Samis Land Company) by Wright Runstad Company and refurbished in conjunction with the construction of the Washington Mutual Tower on the opposite side of Second Avenue. This is a partially intact and early example of a rare downtown retail store/commercial property type from this era. Furthermore, it is associated with a person of significance, Amos Brown. Located at the sloping NW corner of Second Avenue and Seneca Street, this two-story building is actually composed of three separate but unified structures constructed between 1898 and 1914. The southern three bays appear to date from c.1898, the northernmost bay from 1914 and the bay between them from c.1900. Because they are currently considered as a single tax parcel and have a unified exterior appearance they are considered a single building for identification and discussion purposes. The building was designed as retails shops and loft spaces and continues to be used for commercial and retail purposes. The building measures 108’ deep by 120’ with the component facades along Second Avenue being 60’ wide, 26’ wide and 34’ wide. The construction is ordinary masonry and mill with concrete basement levels. The building exhibits a two-part block façade composition and is uniformly clad with ordinary brick laid with very narrow fine mortar joints. The color of the brick varies slightly between each component building with an orange-red color at the oldest southernmost façade. The south elevation at the westward sloping portion of Seneca Street (the partial basement level) is clad with rusticated sandstone. Sandstone is used elsewhere as ornament and trim. The building base is separated from the upper floor by a sandstone watertable at sill height. The façade is divided into irregular bays that correspond to the phased construction and while generally unified in design it exhibits varied fenestration patterns at the upper floor level. At the second floor level, brick piers between window bays are adorned with brick pilasters with plain sandstone bases and capitals and the window heads have stone lintels. A simple stone cornice with egg-and-dart trim piece adorns the brick parapet that is further decorated with recessed brick panels. [A portion of the cornice is missing and the design varies slightly between construction phases.] The south elevation includes one full storefront bay at the corner and the remainder of the windows are small untrimmed square openings with brick voussoir heads and stone sills. The rear elevation exhibits evenly spaced untrimmed segmental arched window openings. All of the second floor façade windows (wooden with large fixed transom lights and heavy mullions) appear to have been reconstructed or replaced to closely match original sash members. Other windows at the south and west elevations have been replaced with dissimilar modern products. All of the storefronts have been reconstructed with a unified modern storefront and lighting design. There do not appear to be any remaining intact or architecturally significant interior building features, finishes or public spaces.